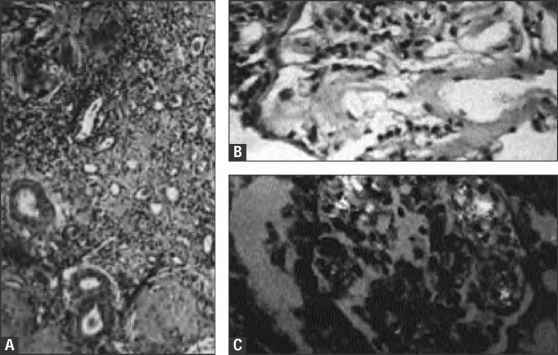 Pathogenesis of Schistosoma mansoni glomerulopathy. Note the crucial role of hepatic fibrosis, which 1) induces glomerular hemodynamic changes; 2) permits schis-tosomal antigens to escape into the systemic circulation, subsequently depositing in the glomerular mesangium; and 3) impairs clearance of immunoglobulin A (IgA), which apparently is responsible for progression of the glomerular lesions. IgA synthesis seems to be augmented through B-lympho-cyte switching under the influence of inter-leukin-10, a major factor in late schistosomal lesions .